This week's outfit was submitted by Lauren of The Little Things We Do. No, I don't have to pee. I'm just terrible at posing. Okay, so for those of you who read through that carefully, you'll realize I didn't exactly follow what Lauren suggested. Partly that was on accident (I thought she said my regular jeans, so I wore those instead of my skinny jeans) and partly that was because it was hot outside when I wore this on Wednesday and I didn't feel like adding the scarf. Maybe it was also because I have no idea how to tie that scarf and have it look normal. Also, I would just like to state--for the record--that my hair looked way cooler when I first did it in the morning. I was totally rocking the side braid like nobody's business. But one two year old and five hours later, my hair needed some re-braiding and it just didn't look as cool as before. So by the time Bryan took the pictures later that evening I looked like this. Bah. One can only look cool for so long, you know? And, like I said, it's hard to take pictures of yourself. How do you feel about this week's outfit? Would you wear something similar? If you'd like to submit an outfit, please refer to this post. I'd love to have more friends participate! To view more awkward pictures of me trying to be cool of my outfits, see the entire Getting Dressed series. Look on Pinterest for how to tie a scarf. I have a few pinned and it helped me immensely! Now I can rock any scarf and I love them! 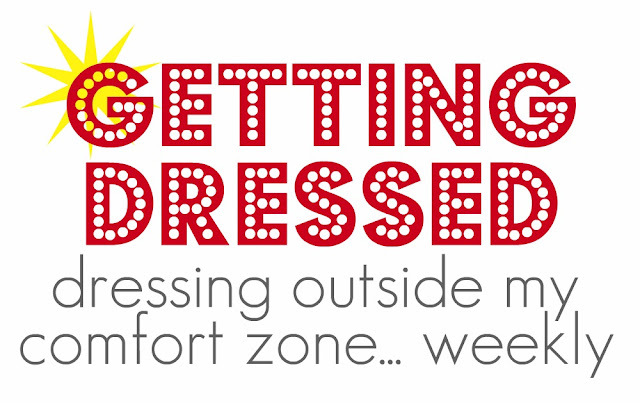 I have totally been thinking about dressing outside my comfort zone. I have just been hating my wardrobe/style lately. you're cute :). next time roll the sleeves on the button-up a couple of times though...just my two cents ;). also...a good trick for scarves...just tie it together in one big loop and then you can have a long infinity scarf and wrap it twice. does that make sense? it's way better, because then you don't have any weird ends hanging down.